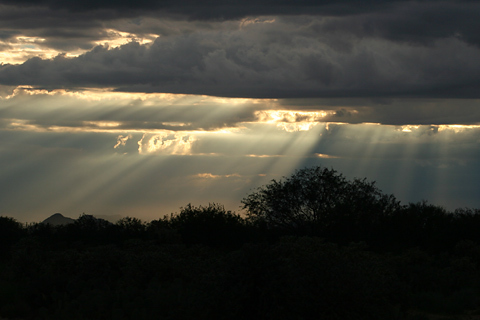 Crepuscular rays are seen when intermittently obstructed, usually low angle sunlight shines through dense atmospheric haze. Crepuscular means "of the twilight", and although these common optical atmospheric phenomena are usually seen late in the day, they can also appear at other times as well. These particular silvery crepuscular rays appeared one September afternoon here in Tucson. The sky was blackening overhead and thunder was rumbling menacingly, but it wasn't yet raining where I was. Just then, the sun rays broke through gaps in the clouds and highlighted a misty band of falling rain to the west.